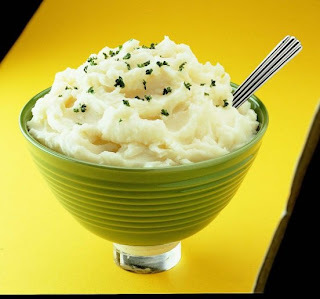 Thanks to the U. S. Potato Board and its consumer website, here are a bevy of recipes for making delicious mashed potatoes in your microwave. At the end of this post you'll also find a video from USPB that clears up any questions you might have about microwaving this ultimate comfort food. Place whole potatoes (do not poke) into microwave-safe dish. Cover dish. (If covering dish with plastic wrap, poke small hole in plastic.) Microwave on HIGH for 10 to 12 minutes depending on strength of microwave. Use oven mitts to remove dish from microwave; carefully remove cover and mash well. Stir in yogurt, milk, butter spread and seasonings. Cook for a minute or 2 more to heat if necessary. Makes 4 servings. Stir 3/4 cup coarsely chopped, loosely packed fresh spinach, 1/2 cup shredded low-fat sharp Cheddar cheese and 2 tablespoons real bacon bits or pieces into hot mashed potatoes with yogurt, milk, salt and pepper. While potatoes are cooking, sauté 1 small chopped onion in the buttery spread for 10 minutes over medium heat. Stir in 1/2 cup shredded zucchini and 1/3 cup shredded carrot; cook for 3 minutes more. Stir into hot mashed potatoes with yogurt, milk and seasonings. While potatoes are cooking, sauté 1 medium chopped onion in the buttery spread for 15 minutes over medium heat, stirring frequently. Stir into hot mashed potatoes with 3/4 cup shredded Gruyere cheese, 1 teaspoon Dijon mustard, 1/4 teaspoon dried dill, yogurt, milk and seasonings. What's in your peanut butter?